This summer, a number of opportunities came up to continue the small solidarity effort I’m engaged in through the WISE Up network and the Manning Family Fund. These seemed too good to miss, so for four or five weeks through August and September I’ve been pretty busy. I try to make a point of writing up what I’ve been doing on one or other of the blogs, partly so there’s a record but mainly to show what can be done with very little in the way of resources (a paintbrush and bedsheet, for instance) and to encourage others to join in. When I found out that the Long March on Newport, part of the protests against the NATO 2014 summit in Wales, was coming through Chelsea’s Mum’s home town of Haverfordwest in Pembrokeshire, I arranged to meet up with the marchers to do some on-the-street solidarity for Chelsea and her family on their ‘rest day’ and to march with them for the start of the following day. 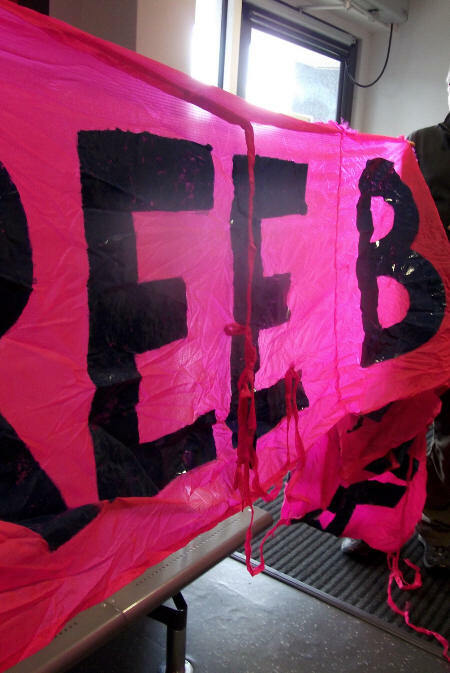 So, on Tuesday 12 August we had a productive day speaking with people in Castle Square before and after lunch, and did a banner drop over the A40 during the evening rush hour. On the Wednesday we engaged with holidaymakers on Newgale beach before walking up to Brawdy base where Chelsea’s Dad had been stationed as a US marine in the 1970s. A report from both days can be read here. 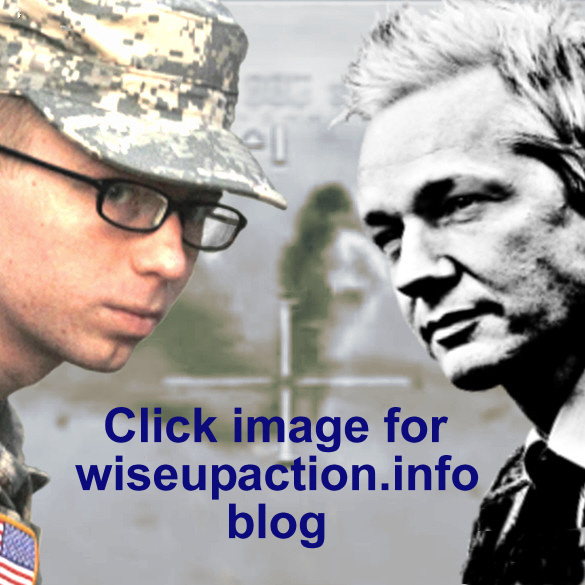 Returning home, I switched focus for a day or two while I tried to make sense of what was going down at the Ecuadorian Embassy in London where the mainstream media had suddenly decided Julian Assange was about to walk out the door and give himself up. He wasn’t, but the media coverage was so bad that I felt obliged to report what actually happened during the press conference in the Embassy on 18 August. 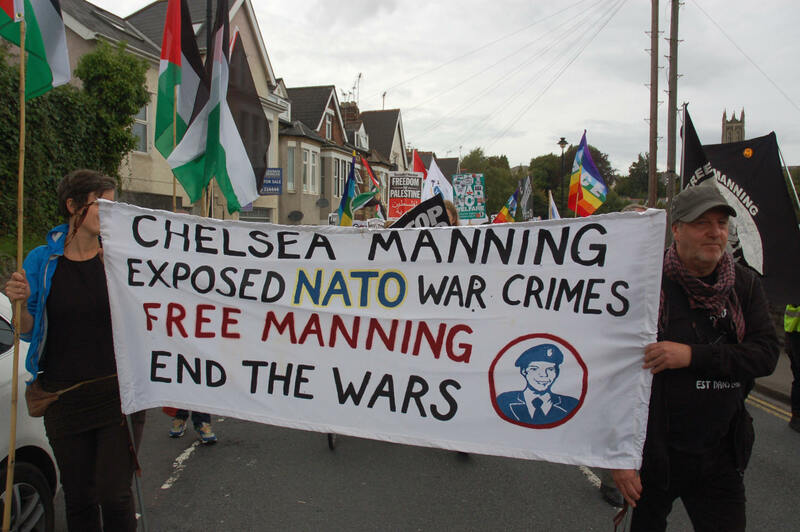 It seemed important to have a presence for Chelsea Manning in Newport during the NATO summit, both because of the Welsh connection and because some of Manning’s leaks exposed NATO‘s criminal activity and corruption. 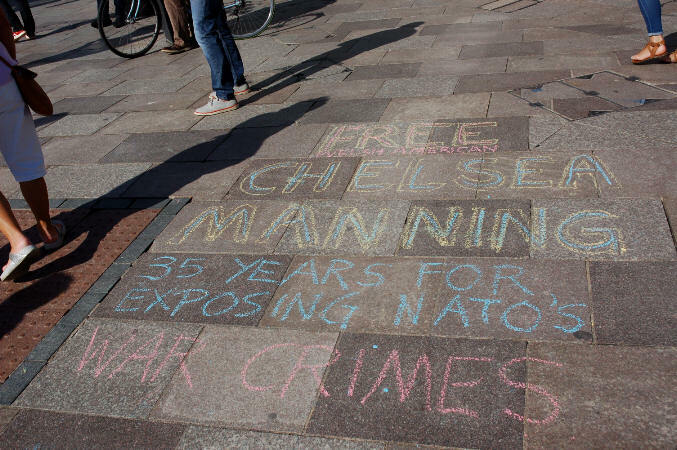 Manning is serving 35 years for telling the truth while the warmongering leaders of NATO get away with murder, literally. With the Long March approaching its final destination of Newport in the days before the summit, I headed south again, taking a last minute diversion via Bristol to register as a driver for the hired minibus we’d be using from our base at the Stop NATO camp in Tredegar Park for a week. I’d volunteered to drive the bus and I was going to do my best not to get arrested, worried that it might jeopardise my visit to Dublin the following week with Chelsea Manning’s Mum, for which we not only had tickets but an itinerary planned. I was tempted to stop and do a repeat banner drop over the M32 with the banners I’d recently reclaimed from Somerset and Avon police after more than a year, but they’re ripped (see below) and it was probably just as well I didn’t have time to stop. 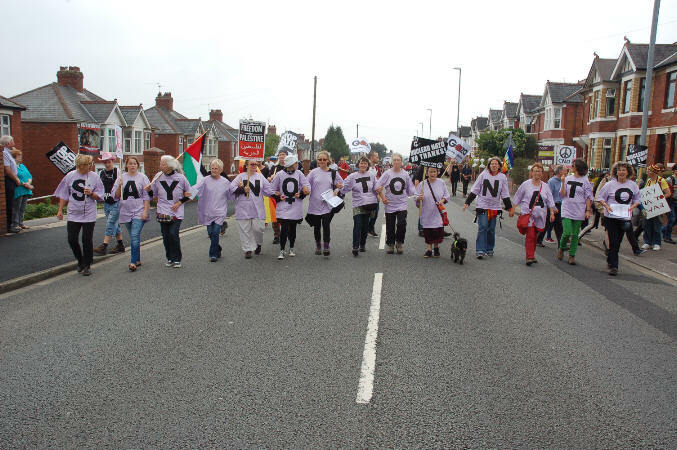 With 9,500 police to a few hundred protesters in Newport, there didn’t seem to be much chance of getting anywhere near the NATO leaders without facing certain arrest – 9,500 cops were going to have to justify their presence somehow – but that by no means removed opportunities for protest, just that there were so many police they kept getting in the way. 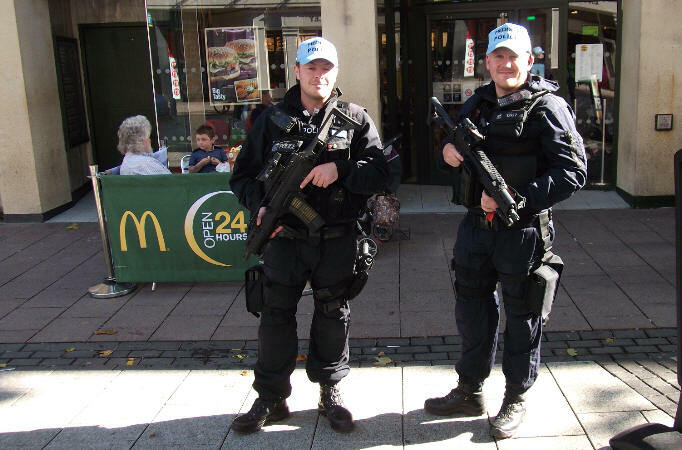 In a ludicrous but also frightening show of military-style force, there were armed cops with big guns wandering round Cardiff shopping centre on the afternoon of Sunday 31 August, apparently acting as private security for McDonald’s. I digress. 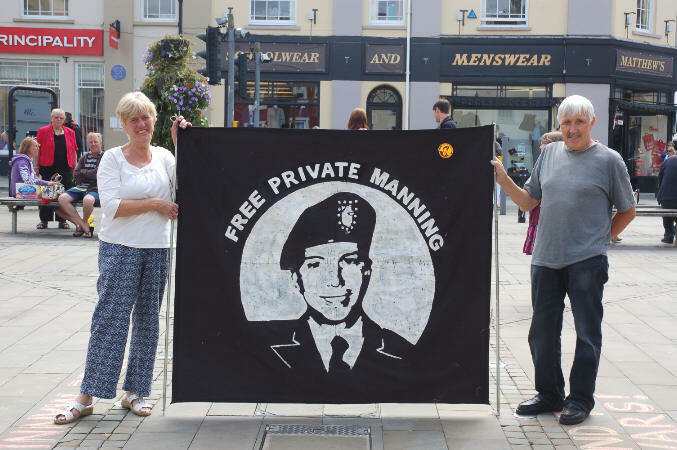 Back in Newport on Saturday, there was a march through town at which we had no fewer than three Manning banners and no shortage of volunteers to hold them. Then, on the Sunday, there was a protest at the security fence around the Castle. We put up banners beforehand at St. John’s, then moved them to the extremely unpopular security fence. Cardiff city centre was busy anyway and we soon attracted a crowd with almost everyone complaining about NATO and the fencing off of their city. 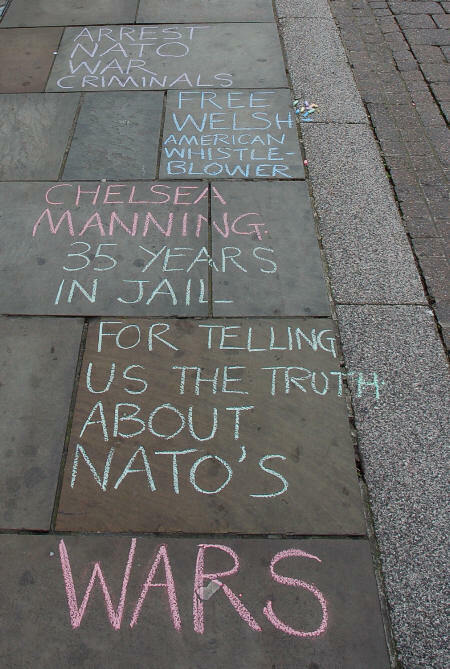 We handed out our flyers about Manning and NATO and did some solidarity chalking on the pavement for when they ran out. 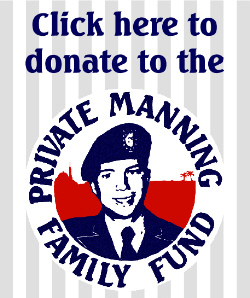 See also our Chelsea Manning and NATO flyer. A report from the weekend’s events can be read here. 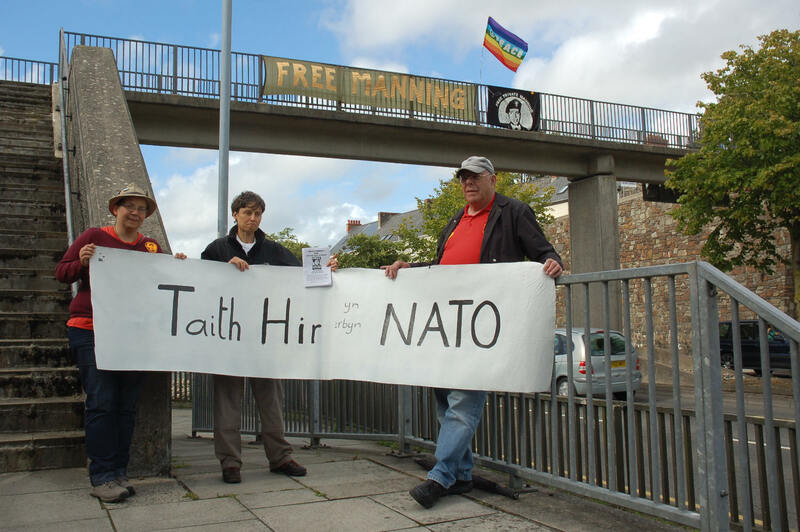 On Wednesday, a couple of us pitched up at Newport police station to report NATO crimes exposed by Manning and to ask the police to stop protecting the NATO leaders from the people and start protecting the people from NATO leaders by arresting them forthwith. You’ll notice from the ‘receipt’ we were given pictured below, that they didn’t seem to have quite the right form for documenting our ‘exhibits’. They refused to take statements and told us the Home Office would be in touch (they haven’t). 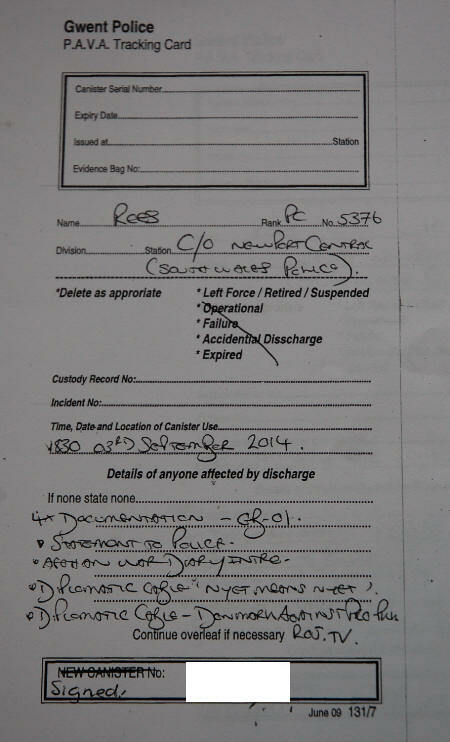 On Thursday, the intrepid Merel Prescott effected a citizen’s arrest on two NATO delegates but once again the police failed to do their duty. 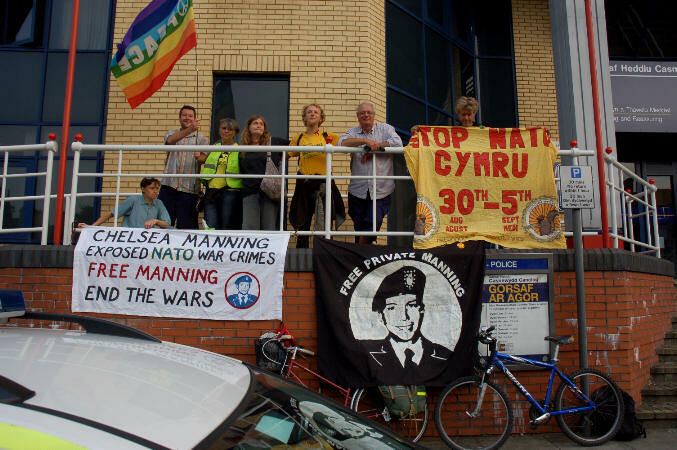 On Friday evening, after the Barclays Bank occupation, die in and protest outside we returned to Newport police station with a larger delegation and more NATO crimes to report. We were kept waiting for over four hours (we suspect until after the NATO criminals had been assisted by the police to escape) and were at the station for over five hours in total, resulting in complaints being made in addition to the crime reports. There had been another march through Newport and up to Celtic Manor on Thursday 4 September, the first day of the summit, but a few of us decided to leave the march and go back into town where we had a vigil for Chelsea Manning as well as exposing some of the arms companies’ nefarious activities and dodgy connections. Back at the camp, there was a whole programme of workshops happening. Monday’s workshops had a focus on class and austerity and I did a session on Chelsea Manning, looking at the economic factors that influenced her decision to sign up with the US army, noting other resistance coming from members of the military – who will be predominantly working class – and considering why middle class liberals ostensibly opposed to war should (but frequently don’t) stand in solidarity with these war resisters, as indeed we all should. We talked about the leaks and just a few examples of what they had revealed, with a focus on NATO. 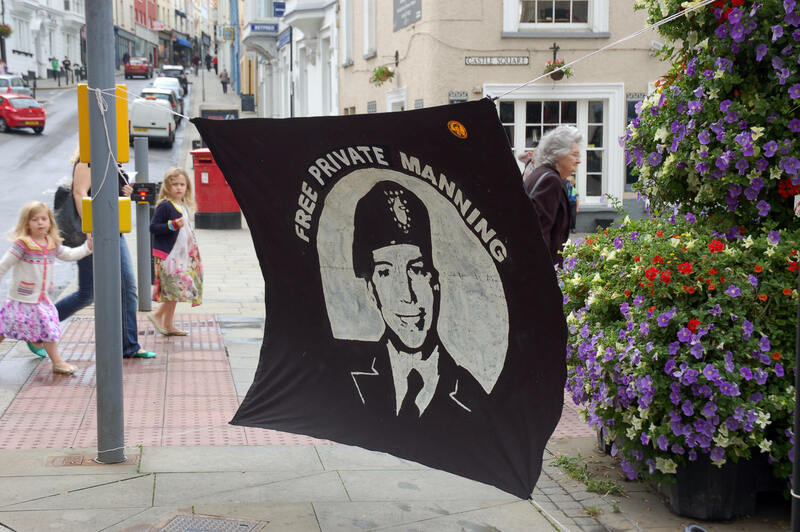 We also considered Manning’s detention for three years without trial, the torture she was subjected to in Kuwait and Quantico, the pre-trials and eventual trial, the sentence, her coming out as a Trans woman. We concluded the session with a brief overview of the solidarity work of WISE Up and more recently the setting up of the Manning Family Fund and direct work with Chelsea’s Welsh-Irish family. The camp was dismantled over the weekend of 6 & 7 September and on Sunday afternoon I set out for Haverfordwest again, meeting up with Chelsea’s Mum in the evening to finalise the details of our trip to Dublin in the coming week. On Monday morning, I was met by local supporters back in Castle Square Haverfordwest, where we put up banners, chalked on the pavement, handed out flyers and stickers and engaged in conversation with passers-by. A softly spoken young man who reminded me very much of Michael Lyons stopped in the square to have a chat with us, saying that he had been in the same class as (then) Bradley at school. I asked him how he remembered Bradley and he volunteered that Bradley wouldn’t stand by and see anyone bullied. He described how a disabled lad from another country had moved to the area and started at Tasker Milward school. Some of the kids were making fun of the boy and Bradley had gone straight up to them and told them firmly to leave him alone. A little later in the morning, Chelsea’s uncle Kevin and auntie Jackie came by, stopped to chat and posed for a photo with the banner. We collected four or five more names and contact details of people who wanted to get involved in solidarity activities, which means there’s the potential for a dedicated group in the area. After a couple of hours we packed up but the chalking was still clearly visible when I cycled back across the square that evening. The following day, I collected Susan Manning and we headed off for a night back in Wrexham, then Holyhead and the Dublin ferry. Read the rest of this account in A month of solidarity with Chelsea Manning, Part 2. 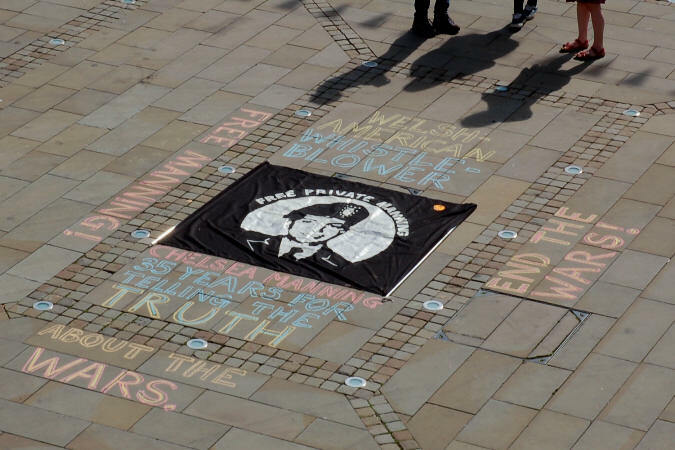 Gallery | This entry was posted in Reports and tagged Chelsea Manning, Dublin, Ecuadorian Embassy, Family Fund, Gerry Conlon, Haverfordwest, Ireland, Julian Assange, NATO summit, Newport, Pembrokeshire, solidarity, Wales. Bookmark the permalink.